This weekend the K League Classic moves onto it’s fifth round of the 2015 season. A few sides have started the season well whilst others haven’t done quite so well. The weather is also getting warmer so it’s a great time to enjoy some live K League action. The league table is still developing as only 4 games have been played so far. Ulsan lead the away on goal difference over Jeonbuk with Suwon close behind. A number of sides a tightly packed into the mid table. 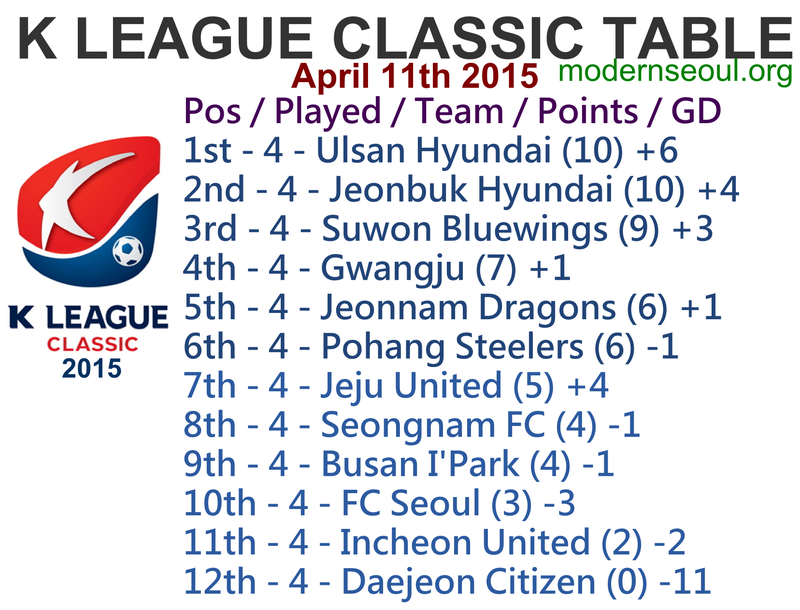 Whilst Incheon United and Daejeon Citizen sadly makeup the relegation places. Saturdays first 2pm game features bottom side Daejeon Citizen and league leaders Ulsan Hyundai. Daejeon Citizen have lost all of their game so far this season. Ulsan Hyundai on the other hand are unbeaten with 3 wins and a draw from their opening 4 games. Ulsan will be obvious favorites in this one. Saturdays 2nd 2pm game is between Seongnam FC and Busan I’Park. Seongnam FC won for the first time last weekend giving them 4 points from their first 4 games. Busan I’Park also have 4 points from their opening 4 games. These sides are tied on points and goal difference, therefore a draw seems the most likely outcome. Saturdays late game features the 2 mid-table sides as Jeju United host Pohang Steelers. Jeju United lost their unbeaten record last weekend and have 5 points from their opening 4 games. Pohang Steelers have recorded 2 wins and 2 defeats so far this season. 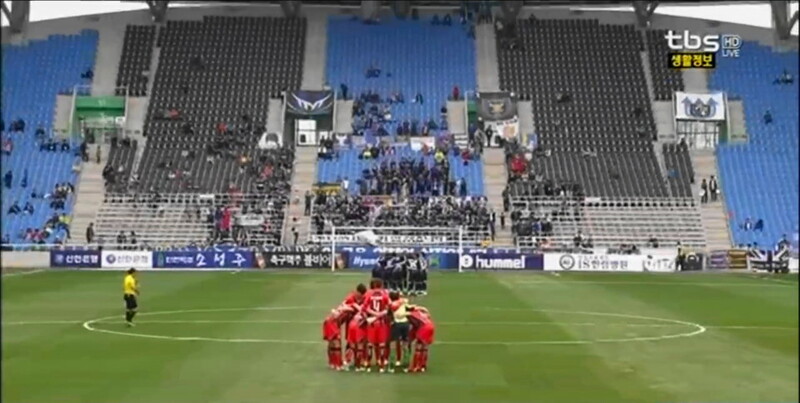 Sundays early game is a local derby between Incheon United and FC Seoul. Incheon United are still looking for their first win of the season with 2 points from their opening 4 games. FC Seoul picked up their first points of the season last weekend with a win over Jeju United. This is always an exciting game and rarely disappoints. However scoreline wise we see this being a draw. Sundays second game features Jeonnam Dragons hosting 3rd placed Suwon Bluewings. Jeonnam Dragons are currently unbeaten with 3 draws and 1 win. Suwon Bluewings are on a great run with 3 wins on the bounce. This will be an even game, however Suwon’s form might give them the edge. Sundays late game features 2 sides who’ve started the season well as Gwangju host Jeonbuk Hyundai in Mokpo. Gwangju lost for the first time this season last weekend, but have 7 points from their 4 games so far. Jeonbuk Hyundai are unbeaten this season with 3 wins and a draw from their 4 games. This should be a close game but we see Jeonbuk having the edge. Park Chu Young scored his first goal since returning to FC Seoul via a first half penalty. However Incheon equalized early in the 2nd half and the game finished all square. The big shocks are the elimination of 3 K League Challenge sides Sangju Sangmu, Gyeongnam and Suwon City. The draw for the 4th round takes place on Thursday April 16th, and all 12 K League Classic sides will enter.